The Kingstowne Striders of Alexandria, VA are proud to present the 9th annual "Fill the Shoes" 5K in honor of Jack. T. Farrar Jr., a long time Hayfield Farm resident who passed away in November, 2005 just 3 months after a diagnosis of stage 4 pancreatic cancer. 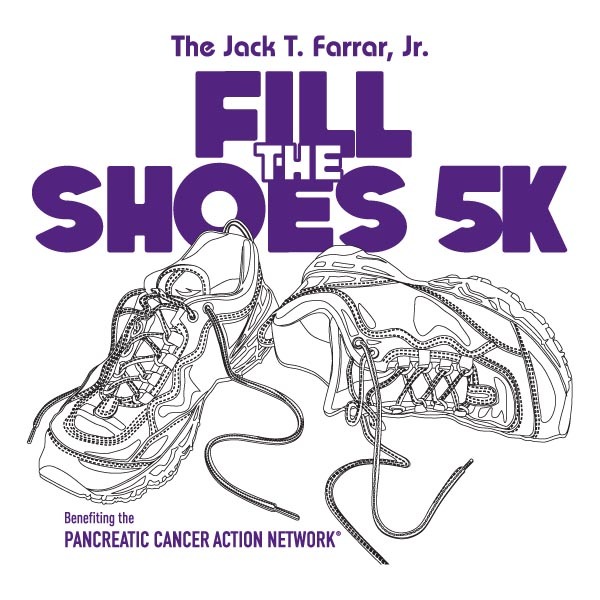 This community race is dedicated to Jack and all people affected by pancreatic cancer. All net proceeds of this event will go directly to the Pancreatic Cancer Action Network (www.pancan.org) to support them in their mission to "advance research, support patients and create hope for those affected by pancreatic cancer". Come support your community and a very worthy cause by running or walking in the Kingstowne Striders 9th annual 5K to fight pancreatic cancer. When. Saturday, November 3rd, 2018. 8:00 AM - 11:00 AM. Registration. On-line registration is open through Thursday November, 1st. Registration is $30 through October 16th and $35 through November 1st. You may register at packet pickup on November 2nd for $40 (cash or check only). You may also register at the race site the morning of November 3rd for $40 (cash or check only). Awards and Extras. ALL race participants will be treated to a custom race t-shirt, goodies from our sponsors, and a great post-race party with food and raffle prizes. In addition, we award the top 3 overall male and female winners AND the top 3 male and female in each of the following age groups (Under 10, 10-14, 15-19, 20-24, 25-29, 30-34, 35-39, 40-44, 45-49, 50-54, 55-59, 60-64, 65-69, 70 & Over). Packet Pickup. Packet pickup will be Friday, November 2nd from 12-6:00pm at Honest Soul Yoga or you maye pick up your packet on race day in Hayfield Park from 6:45am-7:30am.